A small number of US troops were sent to the northern Syrian town of Manbij to deter conflict between the US-backed Kurdish forces and Turkey-backed rebels, the Pentagon has confirmed. Syrian troops have also moved into the area to serve as a buffer. 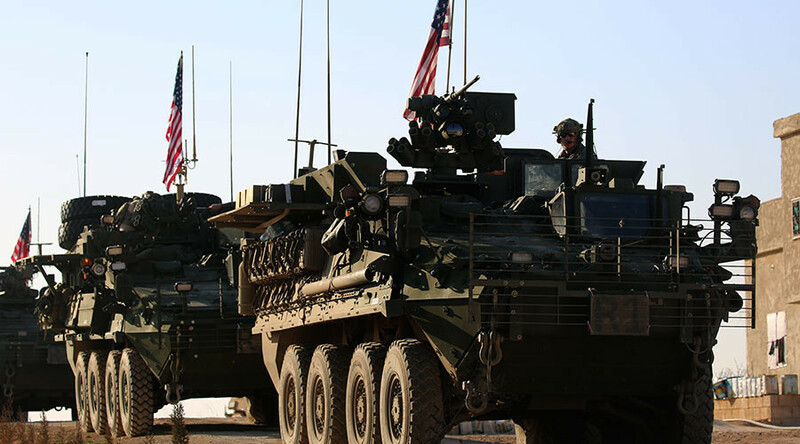 US troops were first spotted in Manbij on Saturday, following the reports of a deal between the US-backed Syrian Democratic Forces and the Syrian government to hand over some 20 villages in a zone between Manbij and Al-Bab, recently taken by Turkish-backed forces. "They are certainly aware of where we are, and we are aware of where they are. There is no intention between the two of there being any conflict against any party other than ISIS [Islamic State]," Pentagon spokesman Captain Jeff Davis told reporters, referring to the US and Syrian forces. The US-backed SDF is mostly comprised of Kurdish militia, considered terrorists by Turkey. Washington has cultivated the SDF as a proxy force on the ground against Islamic State (IS, formerly ISIS/ISIL) independent of the Syrian army, which is supported by Russia and Iran. US troops were sent to Manbij after “the increase in Turkish treats to occupy the city,” Sharfan Darwish, spokesman for the Manbij Military Council, told Reuters. Turkish-backed forces have clashed with SDF troops west of Manbij over the weekend and even on Monday, Darwish confirmed. Last week, the US-backed group struck a deal with Russia to turn over up to 20 villages west of Manbij to the Syrian army, creating a buffer zone between the Kurdish-dominated militia and the Turks. While implementation of the deal has been delayed, five villages were handed over on Monday, Darwish said. SDF forces liberated Manbij from IS in August 2016, just days before Ankara announced “Operation Euphrates Shield.” Turkish-backed Syrian rebels, along with Turkish armor and artillery, have since pushed IS back and captured the key stronghold of Al-Bab, only to see further advance checked by Syrian government troops that linked up with the SDF south of the city. US presence in the area was intended to keep all groups focused on fighting IS, the Pentagon said on Monday.